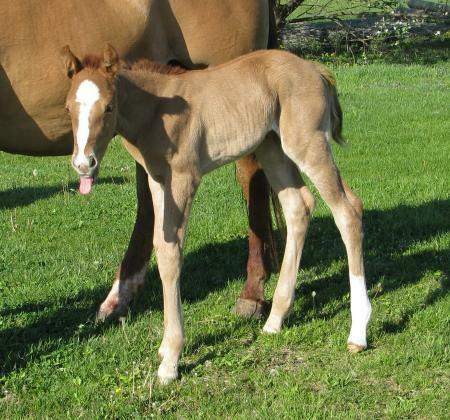 Our first foal of 2010 was born on April 22nd. He is a BIG palomino colt named Sherman. His dam is A Lady By All Means and sire is El Hombre Solano. UPDATE: At 12 weeks of age on 7/15/10 we had to put Sherman down. After being lame for over 6 weeks we made our 2nd trip to the vet and this time they x-rayed his hip and found a lot of damage to the ball and socket joint due to some kind of trauma and the vet felt that he would not recover and I really hated seeing the little guy suffer so elected to end his suffering and put him down. He was a special little guy and will definitely be missed. The bottom 4 pics taken at about 12 weeks old.